Who Started The Argument From Silence? 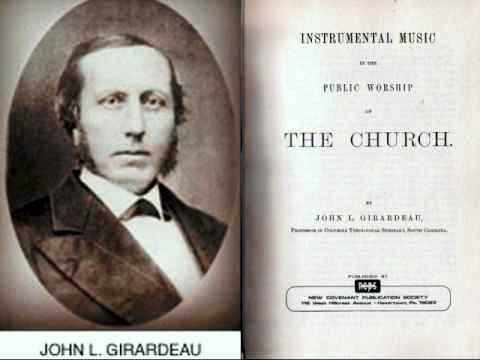 The students of John L. Girardeau, professor at Columbia Seminary, South Carolina in the 1880's, asked him to explain to them why he opposed the use of instrumental music in the worship of the Presbyterian churches. In response, he wrote a book which was published in Richmond, Virginia in 1888. It was titled, "Instrumental Music in the Public Worship of the Church." Girardeau's expanded discussion of this subject gives some valuable insights into how men of the Reformed tradition in late 19th century America decided the question of whether or not a practice was pleasing to God. He first says that the prohibitory significance of God's silence is deducible from II Timothy 3:16-17, which affirms that God's man is fully equipped for "every good work" by the "holy scripture." Everything therefore not mentioned in the Scripture would not be a "good work." Sound familiar? Girardeau then proceeds to give some biblical statements that verify his principle of silence. Exodus 25:40, "And see that thou make them after their pattern which hath been showed thee in the mount." Deuteronomy 4:2, "Ye shall not add unto the word which I command you, neither shall ye diminish from it, that ye may keep the commandments of Jehovah your God which I command you." He cites also Deuteronomy 12:32; Proverbs 30:5-6; Hebrews 8:5; Matthew 15:6; 28:18-20; Colossians 2:20-23; II Timothy 3:16-17 and Revelation 22:18-19. In extending his argument further, our Presbyterian professor treats several concrete instances that argue the prohibition of God's silence. He cites the cases of Cain and his sacrifice, Genesis 4. He mentions Nadab and Abihu, the sons of Aaron, Leviticus 10:1-3 about which he comments: "But they presumed to add to God's commandments, exercising their own will in regard of his worship, they did that which he did not command them, and they were instantly killed for their wicked temerity." He adds the cases of Korah, Dathan and Abiram, Num. 16, Moses' striking of the rock, Numbers 20, Saul's sacrifice at Gilgal, I Samuel 13, Uzzah's touching of the ark, I Chronicles 13:7-10, and the presumption of King Uzziah, II Chronicles 26:16-21. His arguments are then summarized in the following words: "The mighty principle has thus been established by an appeal to the didactic statements of scripture and to special instances recorded in scriptural history... that whatsoever is not in the Scripture, either explicitly or by good and necessary consequences, is forbidden." Girardeau goes on to observe that instrumental music was never used in the worship of Israel without God's explicit command, II Chronicles 29:25-26 and, therefore, could not be used in New Testament worship without an explicit New Testament command. He notes that instrumental music was never used in synagogue worship and that Rabbinic literature forbade its use on the sabbath, save in the Temple. The irony is that I first found this old book preserved in the library of a college operated by avowed restorationists who practice the very thing which Girardeau condemns. The book's card revealed it had lived a quiet life. Who started this "argument from silence?" As nearly as we can determine, God did.